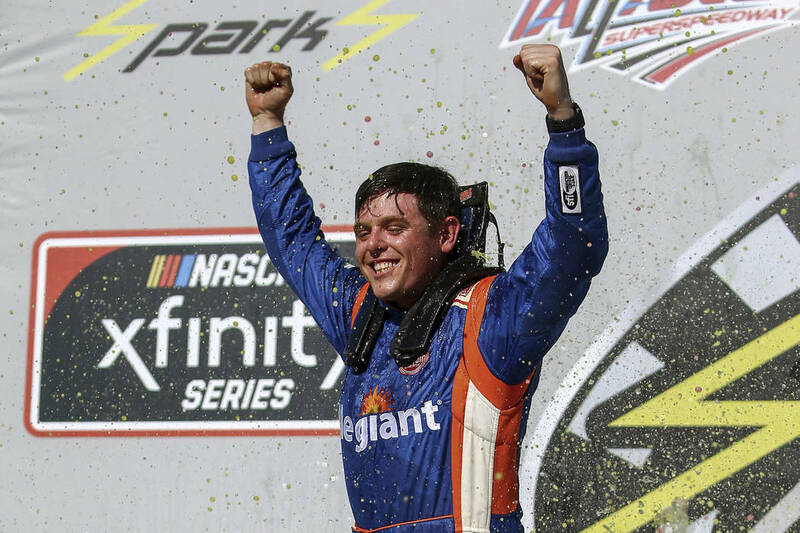 Less than six months after recording a stunning victory at Talladega Superspeedway, colorful Las Vegas native Spencer Gallagher said Friday he will retire from racing at season’s end. Spencer Gallagher’s roller-coaster ride as a NASCAR Xfinity Series driver is over. Less than six months after recording a stunning victory at Talladega Superspeedway, the colorful Las Vegas native said Friday he will retire from racing at season’s end. Gallagher, 28, made the announcement at Kansas Speedway where the Xfinity and Cup Series are racing this weekend. He will assume a managerial position within GMS Racing, the team owned by his father, Maury, CEO of Las Vegas-based Allegiant Air. Four days after his breakthrough victory at Talladega, Gallagher was suspended for violating NASCAR’s substance abuse policy. After being reinstated July 4, he made his Cup Series debut on the road course at Watkins Glen, finishing 35th in a one-off drive with BK Racing. “It has been an incredible journey getting to watch this team grow and flourish and become something incredible from very humble beginnings,” Gallagher said during a trackside news conference in Kansas. “This is not me stepping back from NASCAR. If anything, this is me diving in further. Gallagher’s NASCAR resume includes 60 Truck Series races and 55 in the Xfinity Series, all for GMS racing. He posted 10 top 10 finishes in Xfinity and 15 in the trucks.